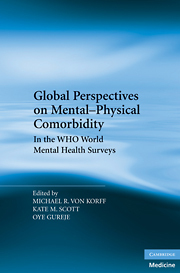 The first volume in our Cambridge University Press WHO World Mental Health Surveys book series. To see more or to order the book, click the cover below. The second volume in our Cambridge University Press WHO World Mental Health Surveys book series. To see more or to order the book, click the cover below. The third volume in our Cambridge University Press WHO World Mental Health Surveys book series. To see more or to order the book, click the cover below. The fourth volume in our Cambridge University Press WHO World Mental Health Surveys book series. To see more or to order the book, click the cover below. The fifth volume in our Cambridge University Press WHO World Mental Health Surveys book series. To see more or to order the book, click the cover below. The sixth volume in our Cambridge University Press WHO World Mental Health Surveys book series. To see more or to order the book, click the cover below. Contact ronkadm@hcp.med.harvard.edu with any questions or comments. See bottom of sidebar for contact information. All other requests for permission to access WMH survey data should be sent to the coordinating center at Harvard Medical School via this email: ronkadm@hcp.med.harvard.edu.